The BMW 3 Series facelift is due out in 2015, and although no spectacular changes in design are to be expected, technically the facelifted high-seller has changed a lot. In 2015, BMW will introduce the facelift of the already highly successful F30 3 Series. The previous top model 335i is replaced from the summer of 2015 by the BMW 340i with a new 330 hp six-cylinder engine. For this generation, BMW has no plans to offer an M340i M Performance model, but that might change in the next generation launching in 2019. Rumors around a possible three-cylinder 3 Series have been circulating on the interwebs for quite some time now, but even though BMW originally planned for it, the decision was made to keep the four-cylinder engine as the entry-level 3 Series – at least for the current generation. 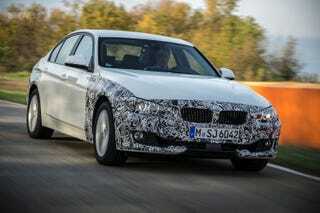 The biggest update coming with the facelift is the introduction of BMW 3 Series plug-in hybrids. Sold as BMW 330e or 328E, the hybrid uses a four-cylinder gasoline engine and an electric motor that provides a system output of 245 hp and comes with a fuel consumption of 2.1 liters per 100 kilometers.